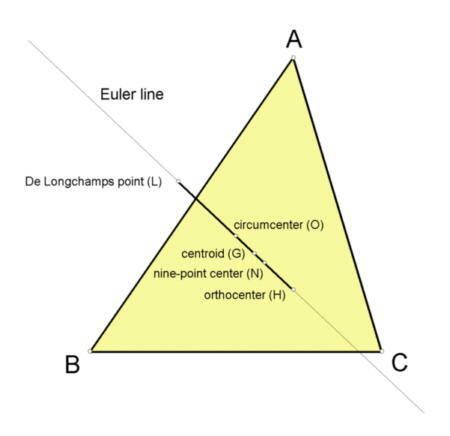 The most famous line in the subject of triangle geometry is the Euler line, named in honor of Leonhard Euler (pronounced Oiler), who penned more pages of original mathematics than any other human being. Suppose ABC is a triangle. Let G = centroid of ABC, and O = circumcenter of ABC. The line GO is the Euler line of ABC. Let H, N, and L denote the orthocenter, nine-point center, and DeLongchamps point of ABC, respectively. These three well-known points also lie on the Euler line. O always lies 1/2 of the way from H to L.
circumcenter = cos(A) : cos(B) : cos(C). Trilinears x : y : z of a point P are any numbers (or functions of the sidelengths a,b,c of triangle ABC) that are proportional to the directed distances from P to the sidelines BC, CA, AB, respectively. In addition to representations by trilinears, the index i for points listed in the book, Triangle Centers and Central Triangles, or simply TCCT, will be given by the notation X(i). For example, centroid = X(2). The above examples indicate that if you know the first coordinate, you can easily write out the other two coordinates. To save space, the other two coordinates will be abbreviated as ": :". Several patterns can be noted in Part 2 of the above list. One of the most striking is the role of the Schiffler point X(21) and the unnamed point X(29) in the constructions of points X(407) to X(416). Letting I = incenter, the Schiffler point is where the Euler lines of triangles ABC, BCI, CAI, and ABI meet. No analogous property is known for X(29), but it would seem, nonetheless, that X(29) must be a close cousin of X(21). (y - z)(cos A)^2 + (z - x)(cos B)^2 + (x - y)(cos C)^2 = 0. It is also easy to prove that a point (x^2) sec A : : is on the Euler line if and only if the point (y^2 + z^2) sec A : : is on the Euler line. Likewise, a point (y + z)/a : : is on the Euler line if and only if the point (x^2 - yz)/a : : is on the Euler line. The aforementioned book, TCCT, catalogues 400 triangle centers, X(1), X(2),...,X(400). In Chapter 9, a chain of 46 distance inequalities is stated. These were found and tested on thousands of triangles by computer. Proofs of some of these would probably be elaborate and lengthy. Here, D(2) = 0, since X(2) is the centroid, lying on the Euler line. Here's how to interpret this chain of 7 inequalities: in every triangle, the Nagel point, X(8), is never closer to the Euler line than the Mittenpunkt, X(9), which is never closer than the Spieker center, which is always separated by the Euler line from the incenter, X(1), which is never farther from the Euler line than the Gergonne point, X(7), which is never farther than the symmedian point, X(6), which is never farther than the 2nd isogonic center, X(14). X(36) = inverse of incenter in circumcircle = 1 - 2 cos A : : . sin 2A sin(B - C) x + sin 2B sin(C - A) y + sin 2C sin(A - B) z = 0.
a (b^2 - c^2)(b^2 + c^2 - a^2) x + ... = 0. (sin 2A) cos(B - C) x + ... = 0.